We’ve been feasting on farmer’s market produce since Saturday. After braising those turnip greens, I used my food processor to shred up two medium-sized zucchini. 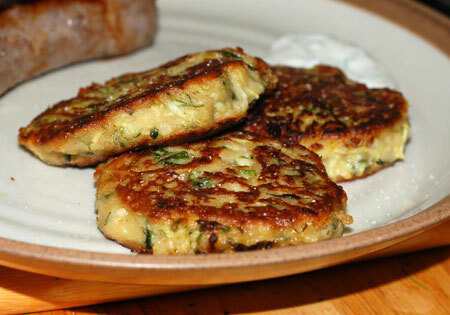 About 3 cups of that was salted, drained, and made into zucchini pancakes to eat with bratwursts. The rest I separated into 1-cup portions and stored in sandwich bags for other uses, namely muffins and pasta. This is one of my current favorite ways of dealing with zucchini, because the shreds are prepared in advance and kind of bury themselves in the background however I see fit to cook them. If I don’t get around to using them all within a day or two, I press as much air out of the baggies as I can, and pop them in the freezer for future use. Last night, I decided to hide some zucchini shreds in a pasta sauce made from yet another clandestine vegetable, fennel. Neither my husband or I like fennel, not being fans of licorice and anise. I’ve tried roasting and braising it in the past, and we just couldn’t get past that flavor. But Italians rave about it so much that every so often, I bring some home and give it another shot. This time, I purchased two small bulbs complete with their extravagant green plumage, and to ease our way back into that fennel flavor, I decided to buzz up some of the herbaceous fronds into pesto. Most of the ingredients are your standard pesto fare—Parmesan, garlic, olive oil, lemon—but I swapped in pretty green pistachios for the pine nuts and added a few leaves of mint from my backyard, the only herb (almost the only plant) that has survived our German shepherd galloping around out there. While my bowtie pasta cooked, I ground up my pesto to the consistency of a spreadable sauce, and sauteed some zucchini shreds with thinly sliced shallot in olive oil, using my largest nonstick skillet. When the veggies were just beginning to take on some color, I threw some frozen peas in the pot with the pasta and drained it all, reserving at least a cup of the starchy pasta water for my sauce. The peas, bowties, and most of the pesto went in with the zucchini, and I tossed everything together with my tongs, adding splashes of pasta water until everything was evenly coated with pesto and neither gloppy nor soupy. A fine chiffonade of mint finished the dish. According to Jeremy, the pesto looked like basil, smelled like mint, and tasted like fennel, so he said there was a flavor disconnect for him. I’ll admit that the fresh mint took a stronger role in the dish than I would have liked, so I’ll just add one or two leaves next time instead of five. But otherwise, I couldn’t distinguish between the flavor of this versus traditional basil pesto (perhaps because in some varieties, basil has mild anise undertones). I thought the pasta did an excellent job of disguising both the zucchini and the fennel, and suspect that this recipe would also be good leftover, as a cold summer pasta salad. I won’t know unless I make it again though, because Nolan ate quite a bit and Jeremy went back for seconds, despite his initial complaint, so there wasn’t any left to chill! There is more fennel to come. I turned one bulb into pickled fennel, which is currently marinating in the refrigerator, so there is one more bulb to use up. I also haven’t done away with all the fronds or stems, but have some more ideas to transform that licorice flavor. Also look for more recipes coming up with turnips, greens, and tomorrow, strawberries! Bring a large pot of water to a boil. Salt the water generously and cook the pasta until al dente, adding the peas in the last two minutes of cooking time. Meanwhile, put the pistachios, garlic, cheese, salt, and pepper in a food processor. Pulse a few times to grind slightly. 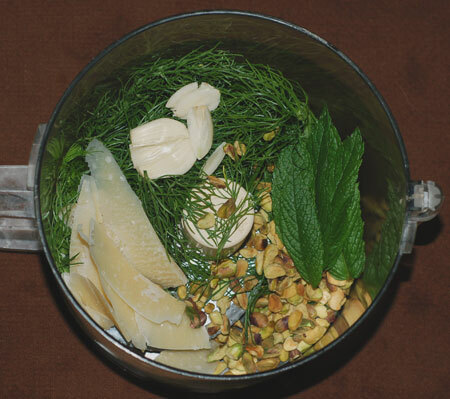 Add fennel and mint, if using, to the food processor. With the motor running, drizzle in the lemon juice, then add olive oil until the mixture is reduced to a paste and has a spreadable, but not oily, consistency. Taste and add salt if necessary. In a skillet or saute pan large enough to contain all the pasta, drizzle some olive oil and saute the shallot and shredded zucchini with a pinch of salt, until it is tender and just starting to brown. (You’ll want to time this so that the pasta is just done cooking at this point.) 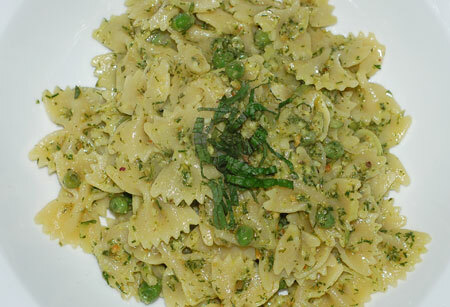 Drain the pasta and peas and transfer them to the skillet, reserving 1-2 cups of pasta water for the sauce. Add a few dollops of pesto and a splash of pasta water, and stir until the pasta is lightly coated and flavorful. (I used pretty much all of my pesto for this amount of pasta, but the amounts are easy to adjust if you want some leftover for other uses.) Squeeze over a little more lemon juice, to taste, and serve hot, cold, or room temperature. Source: Slightly adapted from Recipe, Interrupted.